Click image to enlarge Detail, Penny Postcard: Weyerhaeuser Mill with Mount Coffin, ca.1930. Penny Postcard, ca.1930, "Weyerhaeuser Lumber Mills, Lower Columbia River, Longview, Wash.". Mount Coffin is in the background. Published by Wesley Andrews, Inc., Portland, Oregon. In the private collection of Lyn Topinka. 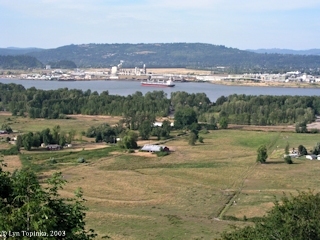 Click image to enlarge Location of Mount Coffin, Longview, Washington. Flat area (behind barge on left) is all that is left of what use to be a 240-foot-high hill. The Weyerhaueser Mill is on the right. View from Rainier, Oregon. Image taken August 2, 2003. 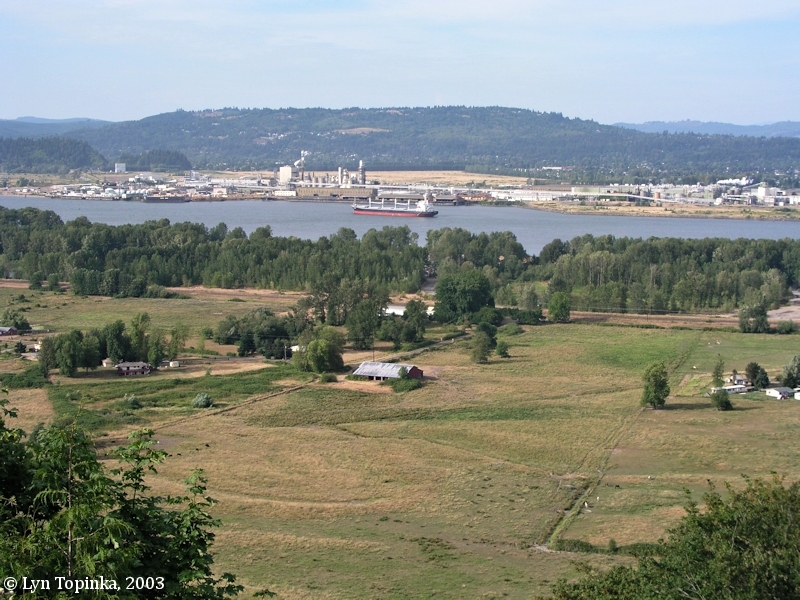 Mount Coffin, once a 240-foot-high hill, was located at Columbia River Mile (RM) 65, three miles downstream of the mouth of the Cowlitz River. Lieutenant Broughton, in 1792 named this basaltic feature "Mount Coffin". Lewis and Clark in 1805 called this feature a "remakable knob". 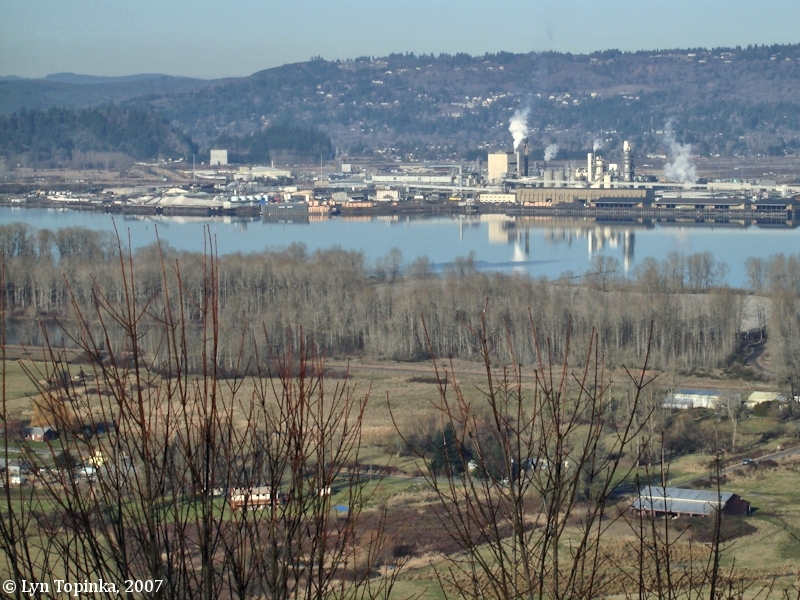 Mount Coffin no longer exists as it was quarried and leveled, and its former location is now part of the flatland of the Port of Longview and the Weyerhauser Mill. Mount Solo is nearby. The Lewis and Clark Bridge, linking Longview, Washington, with Rainier, Oregon, is approximately one mile upstream from where "the knob" use to be. Upstream on the Oregon side lies Coffin Rock, another Indian burial location and often confused with Mount Coffin. 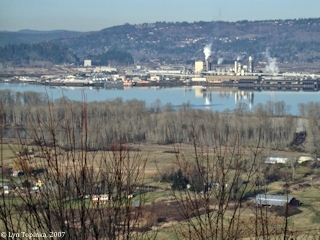 Click image to enlarge Location of Mount Coffin, Longview, Washington. View towards location where there use to be a 240-foot-high hill. The Weyerhaueser Mill is on the right, the former location of Mount Coffin is to its left. View from Rainier, Oregon. Image taken January 31, 2007. Mount Coffin was named by Lieutenant Broughton in 1792. Lewis and Clark passed Mount Coffin on November 6, 1805, and called it a "verry remarkable Knob". From: Gabriel Franchere, 1854, Narrative of a Voyage to the Northwest Coast of America, in the years 1811, 1812, 1813, and 1814, or the First American Settlement on the Pacific: Redfield, New York. "... [May 3, 1811] ... We passed a large village on the south bank, called Kreluit, above which is a fine forest of oaks; and encamped for the night, on a low point, at the foot of an isolated rock, about one hundred and fifty feet high. This rock appeared to me remarkable on account of its situation, reposing in the midst of a low and swampy ground, as if it had been dropped from the clouds, and seeming to have no connection with the neighboring mountains. On a cornice or shelving projection about thirty feet from its base, the natives of the adjacent villages deposite their dead, in canoes; and it is the same rock to which, for this reason, Lieutenant Broughton gave the name of Mount Coffin. ..."
From: Alexander Ross, 1849, Adventures of the First Settlers on the Oregon or Columbia River: being a Narrative of the Expedition Fitted out by John Jacob Astor, to establish the "Pacific Fur Company;" with an account of some Indian Tribes on the Coast of the Pacific: Smith, Elder, and Co., London. "... [July 23, 1811] ... On the 23rd, after a restlss night, we started, stemming a strong and almost irresistible current by daylight. Crossing to the north side, not far from our encampment, we passed a small rocky height, called Coffin Rock, or Mount Coffin, a receptacle for the dead: all over this rock --- top, sides, and bottom --- were placed canoes of all sorts and sizes, containing relics of the dead, the congregated dust of many ages. Not far from Mount Coffin, on the same side, was the mouth of a small river, called by the natives Cowlitz, near which was an isolated rock, covered also with canoes and dead bodies. This sepulchral rock has a ghastly appearance, in the middle of the stream, and we rowed by it in silence; then passing Deer's Island, we encamped at the mouth of the Wallamitte. ..."
Ross calls Mount Coffin both Mount Coffin and Coffin Rock. The unnamed "isolated rock" is today's Coffin Rock, located on the Oregon side of the Columbia River. The 1825 map of the Hudson's Bay Company called "Columbia River, Surveyed 1825" (printed 1826), showed the location of "Mount Coffin", while Coffin Rock, on the Oregon side of the Columbia, was labeled "Corpse Rock". 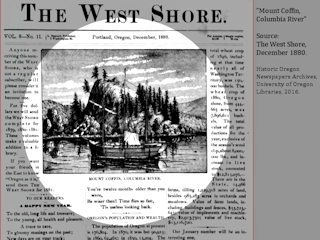 Click image to enlarge NEWSPAPER PHOTO: 1880, Mount Coffin, Columbia River. 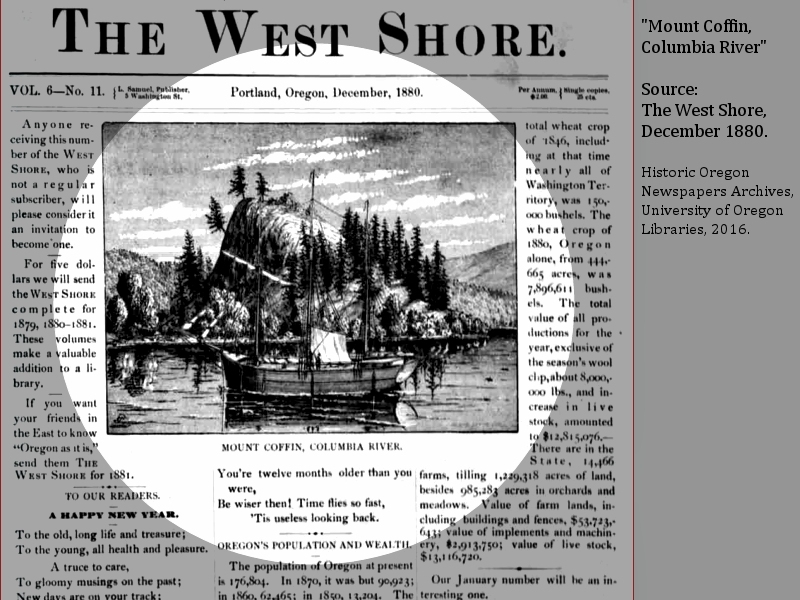 "The West Shore", December 1880, courtesy Historic Oregon Newspapers Archives, University of Oregon Libraries, 2016. Click image to enlarge Penny Postcard: Weyerhaeuser Mill with Mount Coffin, ca.1930. "Mount Coffin, formerly 248 feet high, is being quarried away. In 1941, it was about one-half its original size." Bush Landing was a landing on the Columbia River just upstream of Mount Coffin. It appears on the 1888 U.S. Coast & Geodetic Survey's "Columbia River Grim's Island to Kalama, Sheet #4", NOAA Chart #6143. La Du Landing was a landing on the Columbia River just downstream of Mount Coffin. 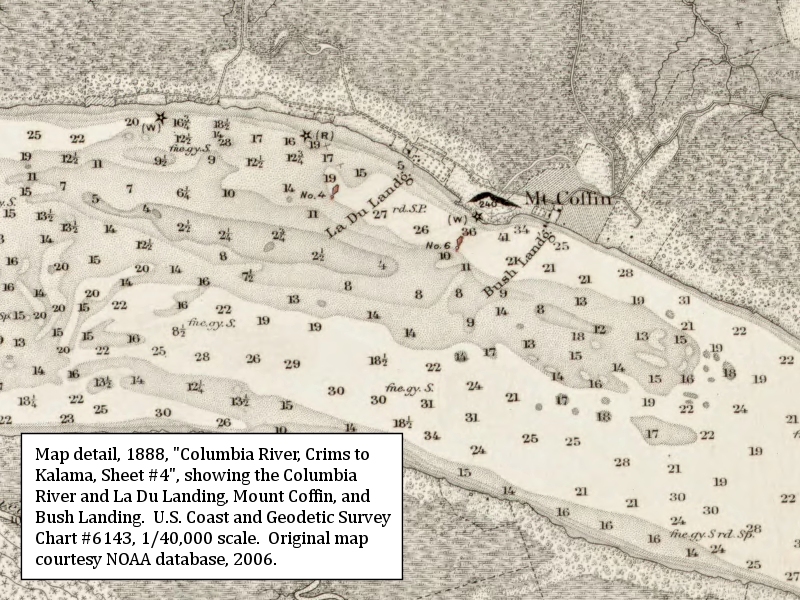 It appears on the 1888 U.S. Coast & Geodetic Survey's "Columbia River Grim's Island to Kalama, Sheet #4", NOAA Chart #6143. 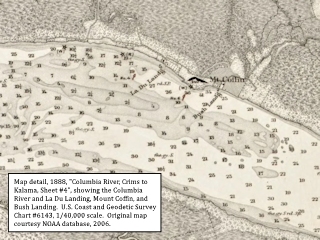 Click image to enlarge 1888, Map detail, Columbia River at La Du Landing, Mount Coffin, and Bush Landing, Washington. U.S. Coast and Geodetic Survey's Chart #6143, "Columbia River, Grim's Island to Kalama, Sheet #4", 1888. In 1913 U.S. Coast and Geodetic Survey placed a bench mark on Mount Coffin. It was destroyed by a quarry rock crushing. A second bench mark was put in place in 1936. It too was eventually destroyed. "Station is on the summit of a rock called Mount Coffin, about 4.5 meters from the northern edge of the rock, which is nearly vertical on that side, and 227 feet above tidewater. The station is marked by a drill hole filled with lead in a a rock level with the surface of the ground. The reference mark is a standard disk reference mark set in an irregular pier of concrete, the top of which is spherical in shape and prjects 6 to 8 inches above the ground. There is a triangular blaze on an oak tree distant 23.3 meters in 89 deg. 25 min W, and a similar blaze on a large spruce tree distant 9.83 meters N 89 deg 14 min W."
Station Recovery (1924): "Recovery note by Coast and Geodetic Survey 1924 could not recover station. It has apparently been lost through the falling away of a cliff on the N side of the mountain." Station Recovery (1934): "Recovery note by Coast and Geodetic Survey 1934, station is lost as a rock crusher in operation at the scene has blasted away most of the hill, leaving at the present a very narrow portion of the northern crest." "Described by Coast and Geodetic Survey 1936, Station is near the highest portion of a rock called Mount Coffin. Quarry operations have reduced this rock to a fraction of its former size, and if continued at the present rate, the rock will entirely disappear within a few years. Station mark is a standard bronze disk wedged in a drill hole in outcropping bedrock ... No reference marks were place." Station Recovery (1937), "Recovery note by Coast and Geodetic Survey 1937, Station recovered as described. Station will be lost within several years, as rock is being blasted away for use in construciton." Station Recovery (1961), "Recovery note by Coast and Geodetic Survey 1961, this station has been destroyed by the operation of the rock quarry. This station is lost." Station Recovery (1961): "Recovery note by Coast and Geodetic Survey 1961, this station was destroyed several years ago when there was a rock quarry in operation at this location. Station is lost." "The Indian names for the snow peaks in the Pacific Northwest varied, as did those of the rivers. It was the rule to name locations on the rivers, but not the river itself. With the mountains, the name depended on the location of the Indians who spoke of them, each people designating them by some appelation peculiar to their own tongue. In some cases neighboring tribes adopted these. Some of the tribes called Mount Hood, Wi-ye-ast; St. Helens, Loo-wit; Jefferson, Pha-to; Adams, Klick-i-lat; Rainier, Tahoma; Shasta, Yee-ka. Mary's Peak was known as Chin-tim-i-ni, and Mount Coffin as Yee-eh-mas-tee." Source: "Oregon Native Son", July-August 1900, Vol.II, No.3.